Dr Michael Mosley with Meri Fatin after a public forum in South Perth. 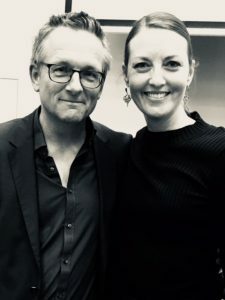 Meeting Dr Michael Mosley last week, I was reminded what an important health message he has brought to the public over the last six years. He’s been making scientific and medical documentaries for the BBC for twenty five years, but it was 2012’s “Eat, Fast, Live Longer” that consolidated his standing as a trusted medical communicator. That year, Dr Mosley had been diagnosed with Type 2 diabetes, the same disease that took his father. Knowing there was no prospect of a cure for diabetics on medication, he decided to find another way. “Eat, Fast, Live Longer” allows viewers to take the journey with him as he finds how broadly healing and protective intermittent fasting is for both body and mind. It’s compelling viewing, knowing that Dr Mosley is weighing up the evidence for the benefits of fasting for very personal reasons. What he subsequently did though, was distill those discoveries into the best-selling “The Fast Diet“, allowing all of us to access this life-changing information. Following on from that was the “8-week Blood Sugar Diet” in 2015 which has been shown to reverse diabetes completely, even in long term sufferers, and “The Clever Guts Diet” in 2017 which highlights the myriad health benefits of maintaining a healthy gut microbiome. Three books, each complementary to the other, that allow us to transform our health from the comfort of home with information that is simply way ahead of current public health messages. In this interview, recorded at Sugarland Studios in Perth, I decided to take Dr Mosley back to some of the key findings he made in 2012 when he embarked on healing himself from the symptoms of diabetes. To listen, you can head to Rare Air 26 – Dr Michael Mosley on iTunes, Soundcloud or LibSyn and the full transcript is below. Intro: Welcome to Rare Air with Meri Fatin, stories of humanity, health, and self-mastery. Doctor Mosley has made countless documentaries since, often experimenting on himself. He has also authored several books including, The 5:2 Diet, The Eight Week Blood Sugar Diet, and The Clever Guts Diet, which have gleaned the best advice he has gathered on how to prolong good health. Michael, it’s great to be with you. Michael Mosley: Lovely to be here. Meri: Hippocrates spoke about the gut 2,500 years ago, but it is only relatively recently that an understanding of this has begun to infiltrate the mainstream and that has had a lot to do with you. How did we lose our way? Michael: I think the problem with the gut, and certainly the contents of the gut is they are very difficult to explore. So, you have got a gut and it’s probably six to eight meters long, and most of it you could not reach, so, it really was an undiscovered country, almost another planet, and certainly, the creatures that live in the gut, the microbiome, the one to two kilos of microbes that live down there, most of them cannot really grow or live outside the gut, so, it was impossible to culture them. Normally, you look at microbes, you get them, say, from a poo sample and then you grow them up and that is where you identify what is going on further up. But, the reality is, there are a thousand different species in there, around 100 trillion individuals, that one followed by 14 noughts, and most of them really could not grow outside the airless, dark confines of the gut. So, it was only really when people started to develop new genetic fingerprinting techniques that we have been able to do that, and certainly, to do so at a cost that means that researchers can really get to grips with what is going on in the deep, dark parts of the bowel. Meri: Let us go back to those very early realizations for you. You said the interviewing the eventual Nobel Prize winner, Barry Marshall and Robin Warren for Horizon, almost 25 years ago, was a seminal moment in your pursuit of understanding the gut. Why did it effect you that way? “Wow, there is this previously unknown organism, it’s doing something really interesting. Perhaps there are a load of other organisms down in the bowel doing equally interesting, mysterious things that we know nothing about, and maybe there is more Nobel Prizes to be won there.” So, from the point of view of the scientific community, this was massive. From a personal point of view, I have always been interested a bit in the bowel, but it was also what happened. I decided to pitch the idea of the history of medicine told through self-experiment. I was then, actually, a director, I was behind the camera and I pitched this idea for about 20 years. Actually, I found somebody who said, “It sounds like a good idea, who is going to actually present it?” I said, “I’ve got no idea,” and she said, “Why don’t you do it?” So, that is how I became a television presenter and in time, that led to me becoming an author. So, all of it goes way back to that original Horizon with Barry and Robin. Meri: As I mentioned in the introduction, you were inundated with response from that documentary that was nominated for an Emmy and a BAFTA, as you say, ten years before that Nobel Prize appeared, what were the main perspectives in those responses? Michael: Well, I talked to an awful lot of gastroenterologists and other doctors while making the documentary, and broadly speaking, they still thought it was nonsense, but, there were a lot of people who responded to the documentary and they did not want to go on taking the pills, or they did not want to have a partial gastrectomy, which was the alternative being offered, you would have part of your stomach removed, which obviously is pretty radical. So, they wanted to try something which promised the possibility of a cure, so, yes, we had something between 5,000 and 10,000. This was int he days before emails, so, it was 5,000 to 10,000 letters and things like that. We had to employ somebody full-time for a while just to produce a fact sheet and send it out, and yes, it went on, the documentary went on selling all over the world, so, I continued to get letters for the next 10 years. Normally you make a documentary and it goes out and that is it, and maybe win an award, maybe you do not, but you move on to something else but this one lingered. Meri: Your enthusiasm for the topic remained? Michael: 100%. I mean, I went off and I did loads of other things. I made some dramas, I made a whole host of other things, but I kind of maintained an interest, I tried to keep in contact with Robin and Barry, I kept reading stuff about the gut, and I kept on reading about new discoveries in the gut. But it was only in the last three or four years that the subject has become unbelievably hot, and I believe that in the last two or three years, the number of scientific papers on the microbiome has gone up about 2,000%. So, that is partly a product, as I say, of the technology. It was kind of like Galileo looking up at the heavens, he has go the telescope and then suddenly, there is a vast universe out there which no-one ha suspected. The same is kind of true of the gut. We now have the tools, the means to investigate it in a way which was not previously possible. No that scientists can do that they have discovered all these extraordinary links between the gut and particularly the microbiome and things like mental health, immune system, weight, all sorts of things that people really did not imagine. Meri: What does it mean to you to be the interface between all of this really important research that is going on and delivering it to the public in a way that we can actually do something with that information? Michael: Hopefully I do it in a sort of interesting, accessible way, because the counter side of it is there is an awful lot of nonsense as well, because when you get these discoveries and lots of people jump on the bandwagon, there is lots of stuff sold as probiotics now in supermarkets and other places, most of which are completely and utterly useless. Equally, there is a lot of food intolerances, which is a genuine phenomena, but people will go off and they will send their hair samples off, or they will send blood samples off, and unfortunately, none of that is even remotely scientific, it’s basically utter specious waste of time and money. So, that is the other side of it. I kind of try to warn people about the nonsense, but there is something genuinely exciting here, and as you say, it’s great because I get to talk to a lot of scientists, they respect what I have to say, they know I am going to treat their research with respect. So, they are very open about what they are up to and in some cases they also tell me about stuff which is coming up, which is also great if you are writing a book like Clever Guts. Otherwise the danger is that it’s kind of out of date even before you have written it because this stuff is moving so fast. But, the stuff in there is still unbelievably topical, so, that is kind of what I am pleased about. Meri: Yes. You talked about a lot of the pseudoscience around the testing, and I think that is an interesting question in that it raises the idea of, you know, often when people are embarking on trying to improve their health in this way, it’s good to have a support person, a kind of mentor to guide you through that process, but your GP is not necessarily the right person. Michael: Unfortunately not, because you know, medical training– I went through medical school, my wife went through medical school, my son has just qualified as a doctor, and none of us really learned anything about nutrition. They do not teach it in the UK, they do not teach it in Australia either. So, it’s kind of a really important area and yet, it’s almost entirely ignored, which is bizarre, I have to say. Therefore, you find that you struggle to keep up to date along with everything else. So, I hope I am, to some extent, a trusted guide on this. I try to give you the good, the bad, and the ugly when I write these books, and I also have a website, cleverguts.com, where I can bring things up to date. Because things do change, I mean, broadly speaking, the message of the book really is as good as we have got at the moment, but I am conscious that there are areas which will evolve, and so, I want to interact with the audience. The joy of books is that you reach a wide number of people and it can be very influential. If you then tie that in with website, then you get the best of both worlds. A website can also respond, people can write in, they can become part of a community, they can do all those other hugely valuable things which are vitally important for moving this stuff on, but also for health. Meri: From that early inspiration about the gut, I am really interested because you have been producing television for a really long time and really exploring the science around health in various different aspects, but was fasting the first thing that really got you excited as it being a new frontier in some ways? Michael: Sure, because that was actually in 2012, and the reason I got interested in it was because I had just discovered I was a Type-2 diabetic like my dad, and my dad had developed Type-2 diabetes around the same age, early 50’s, and he had gone on to develop dementia, he had heart failure, and then he died at the age of 74. So, I could see that was a road that I might be traveling down. I went off to find something I could do about it, because I did not want to start on medication, because I know where that journey ends. So, I was fortunate, I can ring up lots of people, and that pointed me towards intermittent fasting and led to me making a documentary, Eat, Fast, Live Longer, which was all about intermittent fasting and I met some really influential, important, exciting scientists who really inspired me because they had been working this field for a while and it was not something I knew anything about. As I said, prior to that, I barely had an interest in nutrition. You would ask me, and I would say, “Go on a low fat diet, do a bit of exercise,” but I really did not know anything more than that. So, this was the beginning of my education, if you like. Meri: I just re-watched Eat, Fast, Live Longer over the last few days and it’s a really exciting watch in a lot of ways. because of the revelations that are in there, but one of the things that I noticed, and I guess there is no greater leveler as a practitioner than being presented as having the disease that you have maybe in the past advised other people about. But, you were very serious and very pensive about some of the information that was being given to you at the time about what the state of your body was and what you could do to fix it, and whether you were prepared to undertake that. Do you remember those-? Michael: Yes, I remember it very clearly, because as you said, it was very serious. But for me, it was very serious because it was the first time that I Had seriously questioned my long-term health, and as I said, the back of my brain was echoing thoughts about my dad, and I did not want to go down that road. I have kids who are in their 20’s, late-teens and I would like to be around for them. So, for me, it was wholly serious, and I guess, as a documentary, part of its power comes from that. Also, from the fact that I had no idea how it was going to turn out, so, I set off with some ideas and some research, and the researchers on Horizon are very good and they point to indirections, but to be honest, none of us had any idea where the film was going to go to and how it would end. So, I end up effectively inventing a diet, The 5:2 Diet, and I think I say at the end of it, “I think is going to be really big,” but that could have been completely wrong. It could have all crashed and burned at that point, but instead what it did is it led to me writing The Fast Diet and suddenly, intermittent fasting– A combination of the documentary, the book, and whatever suddenly caught people’s imagination and it really took off. But, as I said, it also inspired me to go on looking more at what was going on, what was going on inside me, what was going on inside the health service, looking at things like diabetes and what you can do about it. So, yes, it really triggered a lot of things. Meri: But it’s one of those things, again, where the evidence had been there for a lot longer than we were prepared to accept. You talked about how in the depression, people’s health had improved when they were on lower– I guess, essentially, restricted calorie, but I have a book at home called The Fasting Cure, by a guy called Upton Sinclair, who was a journalist, and I think it’s all anecdotal evidence, but that was written in 1911 and talks about exactly the same thing. About the myriad, the raft of health benefits that can be achieved through fasting. So, I mean, the trouble is, I guess, that it’s socially difficult. Michael: I think so, it’s also, to be honest, nobody was taking it terribly seriously because it was difficult to measure things, there were not any clinical trials going on. We have known that all the great religions have advocated fasting, and mainly for spiritual reasons rather than for health response, although, I imagine the two are sort if entwined. But, this was a coming together, if you like, of religion and science. There were plenty of people I came across who had been doing a lot of research, particularly in animals because that is where a lot of the basic research starts. But that is kind of where I started with looking at calorie restriction, long-term calorie restriction, but I realized that there was no way that I was going to stick to two thirds of my normal calories for the rest of my life, so, that led me to intermittent fasting where scientists said that actually, certainly on the animal research, there was good evidence that that would give you similar benefits. So, it kind of went from long-term calorie restriction to intermittent fasting. Originally, it was kind of alternative fasting, which Krista Varady at University of Chicago who has been doing lot of research in that, but I went to kind of 5:2, and that was under the inspiration of Doctor Mark Mattson, who is an eminent neuroscientist, and again, it’s interesting because his inspiration came from the fact that his father had died of dementia and that is what he investigates, he investigates dementia and Parkinson’s, and he has some very compelling evidence that intermittent fasting is protective for those disorders. Meri: Mark Mattson, I think, is a classic example. It seems to me that the scientists who are involved in understanding how beneficial fasting can be, either for mental or physical health, really walk that talk as well, they live it out because they really believe in it. Michael: Absolutely, and he is pretty skinny. He does quite a lot of running, he tends not to eat until two in the afternoon, and he is also an advocate, and several of them are, of a different form of fasting which you might call 16:8, where you kind of eat all your calories within an eight hour window. He has a sort of understanding of the underlying biological mechanisms. His preoccupation is, he is sort of a pure scientists, he is a pure neuroscientist, over 700 publications, you know, massively cited. But he is really interested in the nitty-gritty, so, he has done mainly animal research and I guess it’s the translation into human research which is, ultimately, the most convincing thing, and that requires quite bit, long-term trials, it requires a lot of money. So, he was delighted that I promoted this stuff because suddenly, people are getting interested in it, they are starting to, perhaps, put a bit of money research into it, it becomes something which is not just some rats, but you can actually see the potential impact on human health. Meri: If we were to adopt it part of it would be that we would have to really change our perspective on what a normal looked like. I remember Luigi [unintelligible 00:17:50] saying to you about how people who severely calorie restrict on a regular basis look like another species and they do though, do they not? They are slightly cadaverous looking. Michael: Certainly some of them are super skinny, you do not have to be super skinny. I mean, the benefits of intermittent fasting are clearest in people who are obese or overweight. So, as a way of losing weight, and clearly when you lose weight you get lots of other benefits, there was interesting stuff, as I said, around the brain and I know Mattson has a big trial going on at the moment looking at people who are at risk of dementia and who have been on 5:2 diet for a while now. You can, basically, be normal weight and decide that this is a way you want to live, which clears you to pump up the calories on the five days to make sure you are not going to lose weight. You do not have to be super skinny, and not all of them are. Some of the researchers look more like you and me, and I am certainly not super skinny. So, I did go a bit skinny and my wife said it was not a good look, so, I balanced out. Meri: Yes, from the health benefit perspective, I mean, the comment that was made by Professor Valter Longo, he said something along the lines of, “I challenge you to find any mediation that would make such radical health changes by all the measures that you–.” You had gone on a four-day fast? Michael: I had, yes. That was kind of an absolute fast. What Valter does is that he has developed, over the last 20 years, a sort of a different variant. There are lots of different variants of intermittent fasting out there, what they have in common is there is a reduction in calories for a while, and the mechanism seems to be that by doing this you start to produce keto embodies, you start to burn fat and the keto embodies, there is some decent evidence about the benefit for brain health and things like that. So, he has something he calls The Fast Mimicking Diet, where you basically go on about 800 calories for five consecutive days and you do that once a month. He has done some pretty convincing evidence trials of that, again, in animals, and now in humans in two or three centers, looking at the impact on a range of things from cancer survival to Type-2 diabetes, to regeneration of the immune system. So, he is another fantastic scientist who is really pushing the boundaries on this stuff. As I said, the thing he advocates, he is pretty much a vegan, so, his belief is very much that we should be cutting down on the animal protein and eating far more vegetable protein and legumes and things like that. Meri: Well, that was leading me to my next question, really, because I wanted to ask you about an explanation for IGF1 and how that accelerates, or decelerates the aging process? Michael: Yes, so, IGF1 is kind of a measure of your cancer risk, and Valter has certainly argued quite convincingly, it’s kind of a variant on insulin. So, insulin is this incredibly powerful and important hormone which has entered center-stage, particularly in the debate around carbs, so, when you eat a meal which is quite rich in starchy foods, what happens is your blood sugars go up and then your pancreas starts to pump out insulin and that will make them go down again. But, insulin is also a fat storage hormone, it is also a cancer promoting hormone. So, having high levels of insulin in your system is not a great idea. IGF1 is a bit like insulin and what Valter argues, quite compellingly, is that if you eat large amounts of animal protein then this pushes your IGF1 levels up quite high and that puts you at greater risk of various cancers. It’s convincing, but not yet compelling, I would say as an argument, it has not compelled me to become a vegan yet. Meri: But I assume that is the reason that he is one? Michael: Well, I think so, and I think he just quite likes the lifestyle. He comes from Italy, his family originated in one of those Blue Zone areas where everyone seems to live to 150 and be super healthy and run up and down the mountainside. So, I think that is one of the things that is kind of driving him. He likes that style of food, and you know, when I go out and eat with him I eat his style of food, but I have yet to move wholly in that direction. I am a bit of a flexitarian now, which I gather a lot of Australians are as well. So, I try and do at least two days a week where I am meat free, but a lot of people are jumping straight from being omnivores into being vegans. So, it has become a big thing in the UK and, I imagine, Australia. Partly motivated by health, and partly motivated by ethics, and the concern about the greenhouse effect and the ethical issues around keeping, rearing, and slaughtering animals. Meri: Yes. One of the things that I found interesting in the research that you included in The Clever Guts Diet, was from the Weizmann Institute, which kind of puts pay to the idea of the energy in versus energy out equation is not quite right. Michael: No, absolutely. That is one thing that sort of annoys me, I mean, there are various things that annoy me when people talk about diet. One of them is that it’s all about energy in, energy out, it’s really simple that somehow this is the second law of thermodynamics, and this is always said by people who have never, ever read any laws of thermodynamics and have no idea what they are talking about. The other things they say is that it’s really simple and I spoke to one weight-loss specialist and he said that it’s not like rocket science, it’s much more complicated than that. So, we know, we are not machines. The idea that we are some sort of old fashioned steam engine and you can just bung anything in and then it will burn stuff up is just nonsense. We are unbelievably complicated, and biome has just added to the complication. So, we know that the mixture of microbes in your gut can influence the amount of calories you actually absorb. I mean, a calorie is just simply a unit of something, you burn it. So, you take it, you put it in the calorimeter, you burn it and then you see how much extra energy is produced. But, you eat a pound of fat, I eat a pound of fat, that does not mean that we will absorb the same amount of energy because our metabolic processes are going to be different, and the microbes down in our gut are going to be different. So, we poo out quite a lot of calories, and we know that people who are overweight tend to have a different mix of microbes in their gut, and we also know from studies they have done where they take overweight children and slim children, they collect poo samples, they feed them to these sterile mice. The poo samples from the obese children, those mice become obese just by eating exactly the same number of calories. So, it really, really is not the case that it’s all about calories in, calories out, because there is a lot more complication than that. Meri: So, is being obese or overweight enough for you to know that you need to do something about the health of your microbiome? Michael: I think the two are just unbelievable closely related. We know that being overweight, and particularly being obese, has lots of unbelievably negative associations on your health. I mean, clearly, being told you are fat is not helpful, being told you need to lose weight is probably not terribly helpful, although, perhaps doctors could do it in a warm, caring, compassionate way on the whole, certainly British doctors do not, and the reason they do not is they assume that the patients either know it or are unwilling to hear it. But, the reality is that the patients would like to engage. Fat shaming is terrible and completely counter-productive. But as I said, the other side of it, which is the idea that you can be fat and fit and all that sort of stuff, I think is also a myth. I think that there have been plenty of studies which have shown that if you are significantly overweight, it really does not matter how fit you are, you are still going to pay some fairly serious long-term consequences. Those range from Type-2 diabetes, to problems with the knees, to fatty liver disease, and all sorts of other stuff. So, it matters, and clearly the costs of the obesity crisis are high, and they are going to get higher. What astonishes me is that governments are not doing more about it, they are not actually pumping more money, more research into helping obesity specialists grapple with the problem. They would rather just deal with the aftermath, which is Type-2 diabetes, blindness, incontinence, and all the other hideous things that we know occur. Meri: When do you think fasting might become part of public policy? Michael: I am not optimistic it’s likely to happen any time soon, but I think it’s something that people have tried. The 5:2 Diet was very influential, I still get stopped in the street all the time by people who say it has changed their lives. It does not work for everyone, you know, nothing works for everyone, but certainly in terms of Type-2 diabetes, there is some really compelling evidence about the benefits. Fasting is perhaps a misnomer, I mean, it would be probably be better to describe it as quite significant calorie restriction. So, when I wrote the original 5;2 Diet, I suggested people cut down to about 600 calories, because that was based on rat studies largely. Nowadays, I tend to say, “Look, 600 if you can manage it, if not, 800.” 800 is kind of the lower end of a low-calorie diet, but that is also the kind of number around which some of the diabetes research is now going. One of my heroes is a guy called Professor Roy Taylor, who is a Professor of Medicine and Metabolism at Newcastle University in the UK. He demonstrated it was possible to reverse Type-2 diabetes in the majority of cases by putting people on an 800 calories for eight to 12 weeks. So, I read a book about it, and I have to say, it has been remarkable. He has done a whole bunch of studies since I wrote the book, all of which pointing in the same direction that Type-2 diabetes is a reversible disease, and many patients, given the option, will do it because they do not want to spend their lives in medication. Meri: It’s a thrilling prospect. Michael: It’s thrilling, absolutely, and it harks back again to Ulcer Wars, and Barry and Robin, because they were there. Ulcers were an irreversible condition, everyone knew that, you had to go on taking medication for life and maybe have your stomach removed if it did not work, and yet, here are two people in Western Australia saying, That is just not true, it is curable, it is reversible. You have to do this,” and Tyoe-2 diabetes, it strikes me as the same thing. Everybody is out there saying that it’s irreversible, and yet, we have known for a long time that it simply not true. We know because of studies done a long time ago using bariatric surgery. If you do that then something like 90% of people, their diabetes goes away within days, and if you maintain the weight-loss, then 25 years later, they are still free of diabetes. So, it’s not like nobody knew this, and yet, they continue, which I find astonishing, to perpetuate the myth that this is an irreversible and progressive disease. The worst thing about that is it just robs people of hope. So, as Taylor said, you might as well just, “Go abandon hope all ye who enter here,” might as well engrave that over the door of every diabetes clinic. My wife is a GP, she said it has been some of the most rewarding years of her life when she started to put some of this stuff into practice. So, yes, I am just absolutely delighted that scientists talk to me and that they are quite happy for me to write about their work and bathe in their reflected glory. Meri: Are there still uncharted frontiers in terms of nutrition that you want to pursue, or do you think you have found the real pillars? Michael: I think, at the moment, there is more stuff to be had around intermittent fasting, different forms of intermittent fasting, as I mentioned, there is sort of a new kid on the block, which is 16:8 where you compress your calories into an eight hour window. A lot of animal study, very few human studies, some people find that much easier to do, frankly, than cutting your calories two or three a week. So, it will be very interesting to see how that proceeds. I was recently at The Karolinska Institute in Sweden, where the Nobel Prize came from, and they have been doing a big study on 5:2 in diabetes and the results were very impressive. So, there are still plenty of critics out there, but hopefully some of these studies will make them think twice. I am not utterly convinced it will change their minds, but it might make them wonder. Then, as I said, when it comes to Type-2 diabetes, I think there is still a lot of fascinating research to be done, both in terms of acceptability of these sort of diets, but also long-term outcomes. The real challenge with any diet is once you have lost weight, how to keep it off. With The Clever Guts, which is really all of them are tied in with each other, and that is what I find genuinely exciting, each of these books has evolved from one of the other ones and has added richness to it. What I love about Clever Guts is the realization that if you can use weight, you go on a Mediterranean-style diet, the evidence is very compelling that although your body will fight the weight loss initially, within six to nine months it will reset. That means that it will work with you to try and maintain the weight-loss rather than fight against you, because there is, again, an utterly nihilistic view which goes, “All diets fail. There is no point in going on a diet because if you lose weight, you are just gonna put it back on again.” Now, this is true of bad diets, there are 50,000 diets out there and most of them are dreadful, but actually, if you have a decent diet, if you have support, if you have a community, if you do the right thing, then the evidence is strong that not only can you lose the weight, but you can keep it off long-term. So, I guess that is kind of an area which I am roaming around in at the moment, and I am talking to all sorts of people at Oxford University and places like that. My wife is actually doing a research project with Oxford at the moment, looking at exactly this subject, so, more mysteries to be uncovered. 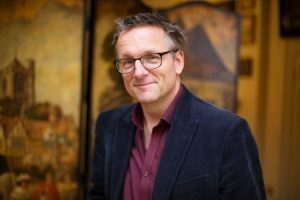 Meri: Doctor Michael Mosley, I think you are a very important messenger to us as a public at the moment, and I thank you so much, you are always very generous with your time. Thank you for being with me. Outro: Rare Air is produced by Meri Fatin for Three Gates Media and mixed by Adrian Sardi at Sugarland studios. You can find the full series on iTunes by searching Rare Air with Meri Fatin. Get in touch at merifatin.com, or on Twitter, Instagram, or Facebook. Thank you for listening.